This entry was posted in Appearances and tagged Allen West, black conservatives, Col Allen West, Democrats, Fox NEws, Liberals, LTC Allen West, Megyn Kelly, Race card, racisim, Rules for Radicals, Saul Alinsky. Bookmark the permalink. Shayn Roby’s Take: Allen West speaks of the hypocrisy employed by Democrats, as they never speak up when white liberals attack black conservatives. Of course, Mr. West is overstating the obvious. In the minds of most sane Americans, the words “liberal” and “hypocrite” have been synonyms for a long time. 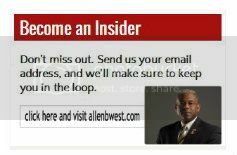 Allen West for President – 2016 (if not sooner). Mr. Allen West, I am so proud of you to stand up for all Black American’s that do not support Obama. Oprah has made her millions off of free enterprise, so why is she complaining? I sure don’t hear you, Herman Cain, Dr. Ben Carson, pulling the race card. It is like you said, it’s not the color of his (Obama) skin, it’s his arrogant, non-loving of America, socialism policies. Maybe if he had followed the Constitution, and showed respect toward the American Flag, and our military. Then maybe, just maybe, he would have gone down in history as being a good President. Thank you again for standing up for all American’s. I have much to say… first off… at 1:13 into this video.. is it just me… or did this woman’s eyelashes stick to the bottom of her lids and get stuck there until she blinked again? Too freaky to believe what I just seen. Now… on to the next issue. If your first issue is about eyelashes…who cares about what else you have to say on the most important issues. My second point is this….. white liberals that attack black conservatives is done by voice.. NOT by murder. Black liberals against any white liberal or white conservative is done by violence.. THAT is the difference. Free speech is your right to voice your opinion. NOW… with that said… sure… WHITES should speak up more but whites also tend to act less on words. Blacks… tend to act on words without even thinking for themselves… and don’t get me wrong… they attend the poorest schools.. and probably intentionally by those who are in power who have lost faith in them because they are more prone to follow hate instead of building up a community. Hell they are killing each other… so please explain this to me how these people are wrong. If the black people do not stand up and be accountable for themselves… then who is expected to be responsible for them? If you don’t like what you get.. change it. People are trying to help.. but they can do only so much… I say this the sincerest intent and honesty. Racism comes in all colors! Dear Colonel West; I was hurt over what Oprah said . I couldn’t believe she actually felt that way. I was totally insulted when Harry Reid said that!!! I’ m so sorry for how some people feel. He’s the ignorant one (and I’m being kind)! In my opinion he should have retired a LONG time ago! He has NO BUSINESS holding that high of a position in our Whitehouse! !! Ugh! Best regards, Monica Hart. P.S. Always enjoy seeing you on FOX! We’ve all got alot of work to do! Please take care my friend.